Homeschool Math Curriculum Bundle - Textbook, Workbook and Solution Guides! 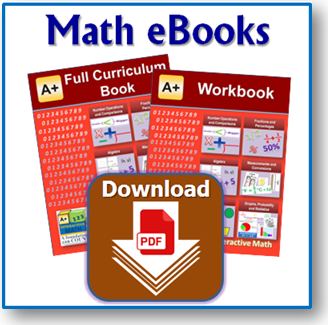 A+ Interactive Math provides eTextbooks and eWorkbooks at very affordable prices. eTextbooks and eWorkbooks are great low-cost alternative to printed books as well as online curriculum. eSolution Guides (PDFs on CD) take the guess work out by proving step-by-step solution to each worksheet and chapter test. Complete curriculum bundle at affordable Prices! Practice worksheets, tests and answer keys for all math concepts taught in each grade level. eWorkbook is available for grades 1-6, Pre-Algebra and Algebra 1 where each grade level is sold separately. It allows your student to practice problem solving to master various math concepts that build a solid foundation in math that you can count on. eSolution guide for each problem on the practice worksheets and tests in the eWorkbook provide detailed solution steps with appropriate visuals to each worksheet and test problem to further reinforce math concepts. A PDF for each worksheet and chapter test makes it easy to locate just what you need. Bring Your Math to Life. Learn faster. Get better grades. Have more fun. Guaranteed!